You know what I love? Traveling on an airplane and just asking for hot water to make my fatty coffee. You know what else I love? Being able to make that coffee, fresh, right there. Yup! 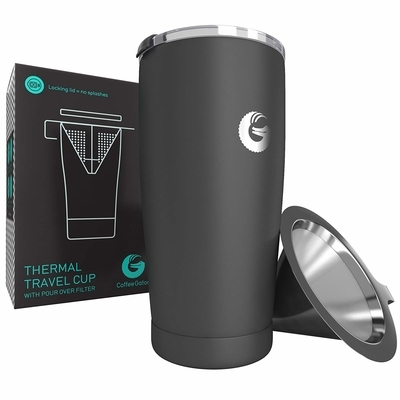 My fatty coffee game got an upgrade when I got this travel mug that brews coffee, and keeps my fatty coffee ingredients safe and sound. Here’s how I use it: Before heading out of the house, I fill the base (the thermos) with fatty coffee ingredients like MCT oil, collagen, and exogenous ketones. I also pack a little baggy filled with coffee grinds. When I’m ready to make my coffee, I place the filter overtop of the thermos, pour hot water on top (I get said water from a cafe, the flight attendant, the gas station, where ever), and the fresh brew drips into the fatty coffee ingredients. Boom! Coffee on the go! This coffee making doesn’t create any waste, just pour hot water over the grounds, then dump the grounds. As long as you can find hot water, you can make coffee. FREE coffee no matter where you go! I’ve asked for hot water at Starbucks and they’ve been happy to fill it up for me.